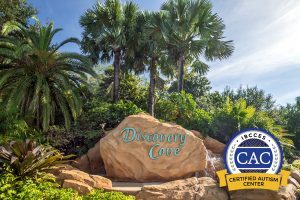 Discovery Cove is the first all-inclusive day resort and animal interaction park in the U.S to be certified as a Certified Autism Center. Learn more here. 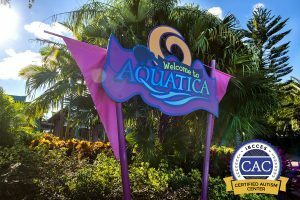 Aquatica Orlando recently announced they have become the first water park in the world to earn the designation of Certified Autism Center (CAC). Learn more about this certification and what it means for your family here. SeaWorld Orlando’s Infinity Falls Grand Opening October 4! Infinity Falls at SeaWorld Orlando is celebrating its Grand Opening on October 4, 2018 at noon. Infinity Falls is open for previews to all guests between now and October 3, 2018. 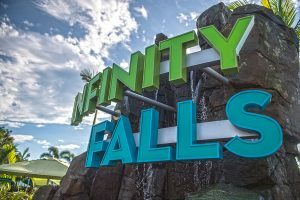 Last week, AllEars.Net was invited to step behind the construction walls of SeaWorld Orlando’s newest attraction, Infinity Falls. No opening date has been announced, but officials are still saying it will happen this summer. Infinity Falls is a water ride — only the theme park’s second — and is sure to be a welcome addition … Continue reading "SeaWorld Orlando’s Infinity Falls ride: A look behind construction walls"
Electric Ocean, SeaWorld’s nighttime summer event, kicks off with a new dolphin and bird show, “Touch the Sky.” This show takes place only once each day, so you’ll want to plan to be at Dolphin Theater in plenty of time for the 5:45 p.m. show. “Touch the Sky” is different from the daytime show, “Dolphin … Continue reading "SeaWorld Orlando debuts Touch the Sky dolphin show; Electric Ocean summer event returns"
Discovery Cove, SeaWorld Orlando’s tropical water park that specializes in dolphin interactions, is suiting up for the summer with new guest experiences. Longtime readers of my blog might remember that my daughter, who plans to one day become a marine biologist and work with dolphins, and I have visited Discovery Cove twice and raved about … Continue reading "SeaWorld’s Discovery Cove offers new Animal Trek and spa experiences"
If you haven’t made it out to SeaWorld Orlando yet this month, you might not want to let this weekend pass without a visit. That’s because it’s the last of the new “Inside Look” weekends, which invite guests learn more about the animals at SeaWorld and meet the team who cares for them. On Saturday … Continue reading "Don’t miss: Last weekend for SeaWorld’s Look Inside event and start of free beer for guests"
Aquatica Orlando&apos;s newest attraction, Ray Rush, is not like your typical family raft ride. This ride is full of thrills without being too scary for even the youngest park-goers. The water slide officially opened over the weekend. Beginning May 25 and continuing through Sept. 2, SeaWorld Orlando will host Electric Ocean, a nighttime party with shows, lights, dance music and longer park hours. After about a five year hiatus, SeaWorld Orlando is bringing back its Just For Kids Weekends, and the fun starts Saturday. For the next two weekends, the theme park is offering families special entertainment, and many of the offerings are included with regular park admission. Children (and their parents) can hear concerts by some of … Continue reading "SeaWorld Orlando brings back Just For Kids Weekends this month"